Percussion plays a key role in propelling a track’s groove and keeping listeners interested. Percussion is fundamental in making your drums sound more complete and musical. 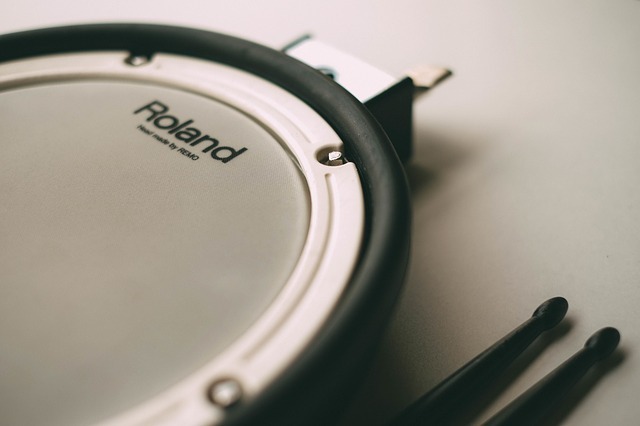 Without percussion, a drum loop would sound static and lack rhythm. In this tutorial we will explore some unconventional techniques that allow you to use percussion in more creative ways. We will look at how percussion was used to create the different musical parts in the demo song below while sharing many helpful tips to step up your percussion game. For this first technique, we look at how to breathe new life into percussion loops by generating unique drum pattern variations using Live’s ‘Sice to New MIDI Track’ feature and Arpeggiator. This technique works great for quickly creating simple or complex sequences of percussion hits that would often take a long time to work out using conventional techniques. The initial setup is fairly easy. However, the process can be streamlined by saving the device chain we will create below as a Slicing Preset. 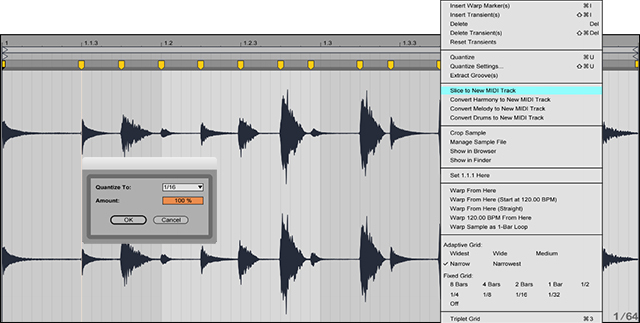 Drag in a new percussion loop to either Session View or Arrangement View. This is an optional step, but its often helpful to quantize the sample hits to the grid before slicing them for more accurate slices. For this example, I quantized the sample to 1/16 by right-clicking in the Sample Editor, choosing Quantize Settings from the context menu, and selecting 1/16 from the chooser menu. Slice the samples up into a Drum Rack by right-clicking the sample clip and choosing ‘Sice to New MIDI Track’ from the context menu. Once the individual sample hits load across Drum Rack pads, click in the MIDI Note Editor and drag out the notes so they sustain for a desired amount of time. You can even create variations in note lengths to retrigger the Arpeggiator’s pattern sequence. Let’s have some fun and quickly generate different percussion patterns on-the-fly. Start by dropping in Live’s Arpeggiator device and placing it before the Drum Rack. Next, launch the MIDI clip and begin adjusting various controls on Arpeggiator and cycling through the different sequence styles to generate a desired percussion pattern. You could also automate some of the controls to evolve the percussion pattern over time. Below is an example of the original percussion loop and a new sequence pattern using this technique. Working with the same percussion loop, let’s look at how to create tech-style synth leads using Live’s Resonator. This device has five parallel resonators that superimpose tonal qualities on the input source to produce new sounds resembling anything from plucked strings to vocoder-like effects. Let’s explore this technique further. To get started simply drag in a new percussion loop to either Session View or Arrangement View, or load a sample into Live’s Simpler or Sampler devices. Load Live’s Resonator device and adjust the various controls to create a musical sound. For example, adjust the Note control to define the root pitch of all the resonators and then transpose each resonator using the individual Pitch controls to create chords that play in key with the project. Also, try playing with the Dry/Wet, Width, and Filter controls to dial in the sound. Sculpt the lead synth pattern by opening the Sample Editor and modulating the clips volume envelope to remove or shape specific sounds, as well as adjust the loop brace to play different variations of the loop. If you are working with any of Live’s sampling devices, then try programming in different note patterns to achieve a desired groove. Bonus Tip: Try duplicating the track and reversing the sample on the new track to create ‘Call and Response’ rhythms. Below is an example of the original percussion loop being processed with Resonator and sculpted with volume envelopes. The third technique we will look at involves using Live’s Gate device and its Sidechain feature to trigger rhythmic gate effects from a percussion loop. This technique works great for creating rhythmic volume sweeps from a pad sound, chord, or sustained notes. The source that triggers the Gate’s Sidechain input can either be an audio sample or MIDI sequence. For this example, we will set the Gate’s Sidechain source to trigger from the same percussion loop we have been using so that the effect matches the groove of the project. Create a new MIDI track and draw in some sustained notes or chord progressions. For this example, I laid out a long note followed by a shorter note to add a groove and then used Live’s Chord device to create a nice pad sound. Drag in Live’s Gate device onto the track you wish to gate. Next, expand the Sidechain controls and choose the percussion loop track as the source to trigger the gate effect. Enable the ‘Flip’ button to reverse the gate’s behavior so that the signal will only pass if its level is below the threshold. Lastly, fine tune the Gate’s Threshold, Attack, and Release settings until you’re happy with the results. Often, fast Attack and medium Release settings work as a good starting point. Bonus Tip: Try modulating the volume envelope on the percussion loop to create variations in the gate effect. Below is an example of a pad being rhythmically gated by a percussion loop. Looping percussion samples can often become monotonous over time. One way to remedy repetitious loops is to add some subtle variation to keep things interesting. This technique can be achieved very easily by looping percussion samples at odd numbered bars. For example, if you have an 8 bar loop, try looping the sample every 7, 5, or 3 bars so that the rhythm changes over time and sounds more interesting. Bonus Tip: This technique also works great for various other drum loops, arpeggiated synth leads, and anything else that becomes tedious over time. The final percussion tip we will look at involves using Live’s Follow Actions feature and Legato Mode to randomly generate new percussion sequences. Follow Actions allow you to create a chain of clips that can trigger each other in an orderly or random way. Legato Mode is an additional setting that controls the playback position for each clip being triggered by a Follow Action. When a clip is launched in Legato Mode, it will continue to play from the position where the previous clip left off on that track without ever losing sync. For example, if the previous clip stopped playing at bar 2, the next clip triggered by the Follow Action will begin playing at bar 2. 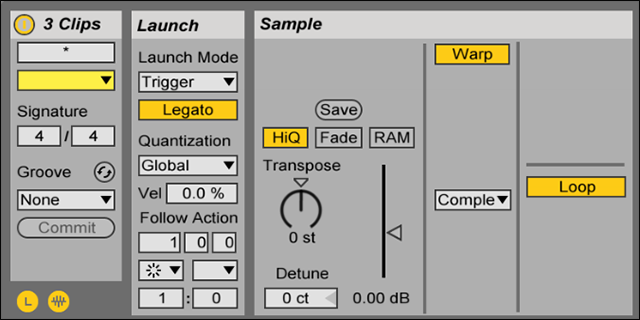 If Legato is disabled, each clip will launch from the beginning of the sample every time and would eventually sound static. This technique works great for quickly adding variation and creating interesting percussion sequences that would often take a long time to program manually. Let’s look at setting up Follow Actions further. Load a few different percussion loops onto the same Audio Track in Session View. Select all the loops and in the Clip View locate the Launch Box. Looking at the Launch Box, set the Launch Mode to ‘Trigger’ so that the clips continue to launch until stopped. Enable Legato so that clips being launched take over the play position from the previous playing clip. Select any of the eight Follow Actions from the chooser. For this example, I selected ‘Other’ so that the clips launch randomly and produce more variations. Finally, set the Follow Action time control to define the beat for when the Follow Action takes place. For this example, I set the time control to trigger the Follow Action every 1 bar. Eighth and sixteenth note divisions work great as well. Below is an example of three different percussion loops being randomly launched using Follow Actions in Legato Mode. In this video, Ableton Certified Trainer Thavius Beck demonstrates Follow Actions in more detail.